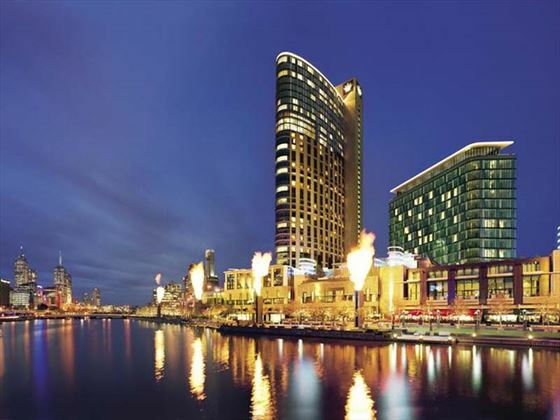 Crown Towers Melbourne sits on an enviable location, along the modern waterside front of the Yarra River, in Melbourne's vibrant Southbank precinct. This luxury hotel is part of our platinum collection and deservedly so, with an extraordinary choice of 10 restaurants, all offering different cusine and ambience, a fabulous gym and pool and an extensive range of elegantly designed, luxuriously-appointed rooms, with lovely views, and a location to envy all others. A perfect base to explore the great city. 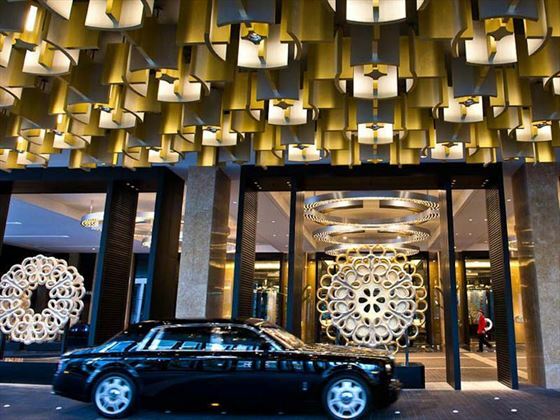 Crown Towers rises above Melbourne's vibrant Southbank precinct and is the perfect spot for looking around this great city. 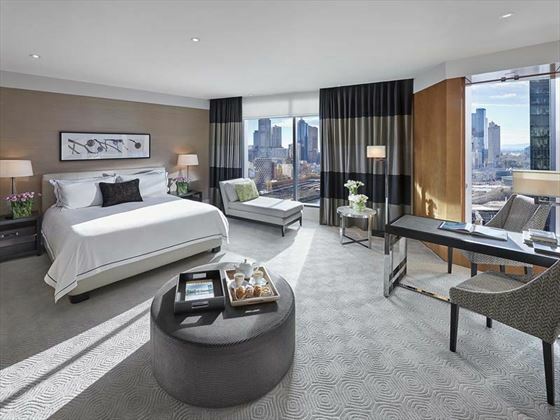 Deluxe Rooms - The Deluxe Room at Crown Towers Melbourne features a spacious bathroom with double marble vanities and deep soaking bath with television, separate shower, walk-in dressing room and the latest in-room technology. 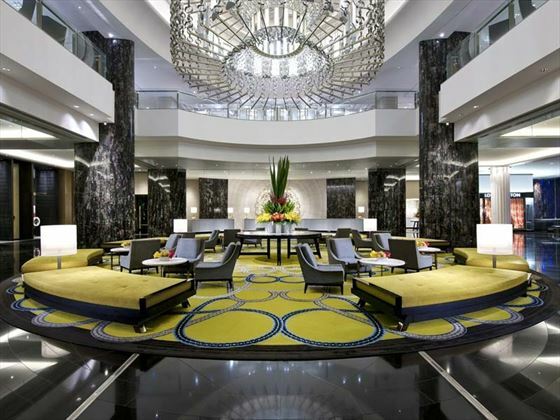 Premier Rooms - Located on levels 19 to 28, floor to ceiling windows offer sweeping views of the city, Yarra River or picturesque Port Phillip Bay. The Premier room features a spacious bathroom with double vanities and deep soaking bath with television, separate shower, walk-in dressing room, high speed wireless internet access and the latest in-room technology. Studio Room - Studio rooms offer 55 square metres of contemporary luxury with views of the city skyline, Yarra River or Port Phillip Bay with a guaranteed level of the 8th floor or above. The Studio Room features a generously sized marble bathroom inclusive of a deep soaking bath with television, separate rain shower and an oversized king bed with luxurious custom made bed linen. 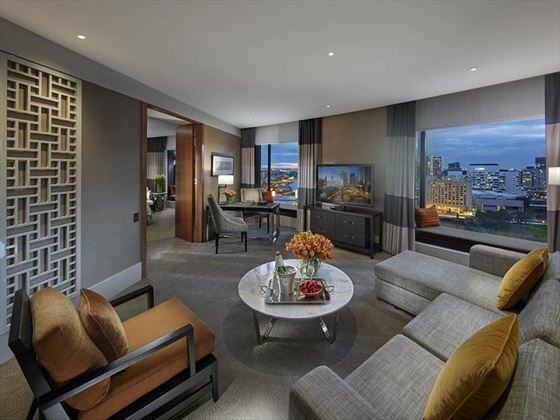 Premier and Premier Club Suites - The one bedroom Premier Suites and Premier Club Suites+ offer 70 square metres of unparalleled luxury enhanced by floor to ceiling windows taking in 180 degree panoramic views of the city skyline or Port Phillip Bay. Located on Level 5 to 18, the Premier Suites boast a separate lounge area, a stunning bathroom with double vanities and deep soaking bath with separate shower and walk-in dressing room. It also features the latest in-room technology. Located on Level 19 to 28, guests who choose to stay in one of the Premier Club Suites have complimentary access to our Crystal Club Lounge with personalised check-in, buffet breakfast, afternoon tea and pre-dinner drinks and canapés. +Only guests staying in a Premier Club Suites have access to Crystal Club. Tower Suite - At 150 square metres, the Tower Suite features two large bedrooms, two ensuites, a separate lounge living and a formal dining area. The first bedroom houses one king size bed, and two king single beds in the second bedroom. Encompassing all that is offered by the Executive & Premier Suites, the Tower Suite offers enough space for the whole family. 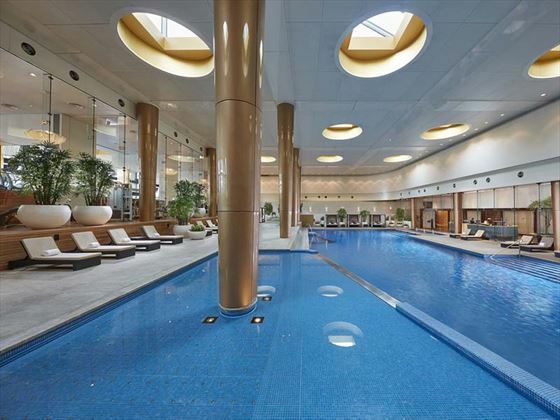 Deluxe Villas - Located on the 30th and 31st floors with incredible views, the Deluxe Villas at Crown Towers Melbourne were designed to epitomise world class accommodation and offer a level of service and luxury unavailable in any other hotel in Australia. With the character of a fine penthouse residence and access via private express lifts, each Villa also offers exceptional 24-hour butler service for guests. All Villas feature an entry hall, generous living and dining area and study alcove. Each Villa offers oversized marble bathrooms, spa bath with television and separate shower, custom-made furniture, remote control curtains, separate dressing room, the latest in-room entertainment and access to the exclusive Crystal Club Lounge. One Bed Crystal Villa - Inspired by the world’s most famous and design driven cities, each one bedroom Crystal Villas at Crown Towers Melbourne boasts unique features and opulent custom-made furniture. The living area is bathed in light from the floor-to-ceiling windows highlighting the meticulous attention to detail through the sumptuous furnishings, plush pile carpets and contemporary artwork while the Butlers kitchen and spacious dining area are an entertainers dream. The separate bedroom features a King sized bed, marble bathroom with every imaginable amenity and a state of the art entertainment system. A resident Butler is on hand 24 hours a day to cater to every need, while guests enjoy Crown Towers luxury at its absolute finest. Two Bedroom Crystal Villas - Setting the standard for luxury accommodation, our Two Bedroom Crystal Villas at Crown Towers Melbourne feel like lavish private residences. Featuring access via private express lifts and our world-renowned 24 hour butler service, each Villa boasts unique designs alongside the finest custom-built furniture. Complete with a dining area with a round mahogany table that seats 6 people, a cocktail bar and a sumptuous living area with city skyline views. The master bedroom features a deluxe king-sized bed, walk in closet, and an oversized marble bathroom with double vanity sink, spa bath with a built-in television and a separate rain shower. The second bedroom comes with two double beds and a spacious marble ensuite. Crystal Club lounge access is included for four guests. Bistro Guillaume -Inspired by France's most popular neighbourhood bistros, Bistro Guillaume features an extensive outdoor terrace, a hallmark of the world's best bistros, a zinc-topped bar, a private room and a spacious, welcoming dining area. Not only can you select from a daily ‘plat du jour’, the menu also features French bistro classics such as duck confit, expertly prepared steak dishes and salads, complimented by the tightly edited wine list sourced from France and boutique Victorian wineries. Bistro Guillaume is equally accommodating for solo diners as it is for families, small groups and couples alike. Dinner by Heston Blumenthal - Dinner by Heston Blumenthal offers a modern menu inspired by historic British recipes from 14th century cookbooks of the royal chefs of King Richard II to Lewis Carroll’s flights of fancy. Capturing the fantasy and theatre of the times, Dinner by Heston Blumenthal has won global recognition for its award winning cuisine, including 2 Michelin stars in its London establishment. Decorated in dark wood, brown leather and burnished copper, Dinner by Heston Blumenthal fuses classic and contemporary for a truly unique dining experience. Koko - The multi-award winning Koko combines traditional Japanese architecture, authentic cuisine and five star service in Melbourne. Experience the serene ambience created by internationally renowned designer Tony Chi amidst the tranquil surrounds of a Japanese water garden. Koko features authentic teppanyaki and a la carte cuisine, and is famed for the quality of its sushi and sashimi. A sake bar offers the city’s best range of aged and exclusive sake from Australia and Japan. Long Chim - Long Chim means to ‘come, try and taste’ in Thai and we invite you to enjoy Crown’s newest restaurant which will transport your senses to the local markets of Bangkok. Inspired by the flavours and energy of Thai street food culture, world renowned chef David Thompson has created an authentic and vibrant menu featuring unique shareable dishes to be enjoyed alongside an outstanding cocktail and wine list. Nobu - Nobu is the world’s most recognised Japanese restaurant, known for its innovative new style Japanese cuisine and exceptional service. Nobu started as a business partnership in 1994 between Chef Nobu Matsuhisa, his partners actor Robert De Niro, producer Meir Teper, and managing partner Richie Notar. With the original restaurant in New York, the Nobu brand is now currently established in many locations around the world including London, Tokyo, Las Vegas, Milan, Hong Kong and Waikiki. Nobu restaurants, all a visual and culinary delight, continue to win unprecedented praise and rave reviews from such publications as the New York Times, the Zagat Surveys, and the Michelin Guide. The restaurants' perennial popularity and devoted following are a tribute to Nobu putting his own spin on traditional Japanese cooking. Rockpool Bar and Melbourne - At Rockpool Bar & Grill Melbourne, Neil Perry elevates the steakhouse concept by uniquely combining an impressive dining room, complete with a dramatic open kitchen and wood fire grill, with a contemporary menu featuring the finest and freshest ingredients. The wine list features an impressive selection of over 1,200 wines from Australia and Europe, and the informed and professional service team can help guide you through the extensive selections, creating a unique dining experience. Rosetta - Located at the northern end of the promenade near Crown Towers, Neil Perry’s Rosetta is a sophisticated Italian ristorante that combines an impressive Iain Halliday-designed dining room with professional and authentic service, and a seasonally driven menu of Perry's favourite regional recipes from his extensive travels through Italy. At the heart of Rosetta's fast-paced kitchen is a wood fired oven and char-grill for creating simple Italian dishes such as suckling pig, roast chicken and wood fired suckling lamb. Pasta is also a major feature of the menu with two dedicated chefs hand-making over 16 different kinds each day, from maccaronara, cavatelli and garganelli to the more traditional fettuccine, pappardelle and gnocchi. Silks - Silks provides one of Melbourne’s truly memorable dining experiences. Walk past the softly trickling water feature and into this opulent and sophisticated Chinese restaurant designed in the style of a Chinese mansion, complete with a Mongolian silk tent. There are five private dining rooms, all beautifully decorated with stunning Chinese antiques, with lively city and river views. Superb Cantonese cuisine prepared by skilled Cantonese chefs including chef de cuisine Fei Wu, is served on delicate chinaware and complemented by a truly impressive wine list. Spice Temple - Based on the winning formula of its Sydney sister, Neil Perry’s Spice Temple Melbourne is a modern, moody restaurant specialising in regional Chinese cuisine. Seasoned with an unmistakable Chinese flavour, Spice Temple's unique and truly special dishes are driven by a long fostered passion for Asian cuisine and delight the senses with their contrasting tastes and textures. "With the dusty aromas of dried spice and the intensity of chillies - dried, fresh, salted, pickled, brined and fermented - Spice Temple's food is cooked to excite, yet the balance and harmony is never lost. This is the cornerstone of truly beautiful Asian cooking," says Perry. The Atlantic - The Atlantic Restaurant opened in 2011 and today epitomizes Melbourne's simple yet exquisite food culture. A popular destination for private and group dining experiences, the waterfront restaurant boasts stunning views of the city skyline, unique architecture and the finest produce available from the land and sea. Executive Chef Donovan Cooke crafts new menus daily, based on the freshest seafood available in the markets that morning. Inspired by wild and sustainable produce, The Atlantic Restaurant's à la carte dining and degustation menus, offer a celebration of the amazing flavours that are created by highlighting quality local Melbourne ingredients. Whether you are looking to be a part of the kitchen theatre or looking for privacy against the backdrop of the finest wines, The Atlantic can accommodate you for an unforgettable dining experience. 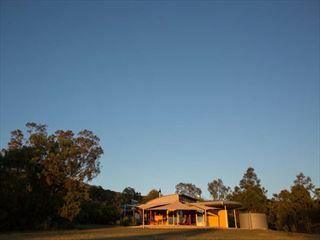 Undeniably Australia's most exclusive and sophisticated day spa with tranquil surrounds, relaxing décor and the ultimate in private pampering suites. A team of expertly professional spa therapists are dedicated to enhancing your sense of wellbeing with indulgent and truly effective La Prairie and Subtle Energies treatments that are sure to soothe and revitalise mind, body and soul when staying at Crown Towers Melbourne.